"Compared to the Mayor’s plan, the Commission’s plan has considerably lower operating and capital costs and a simpler fee structure. By increasing both the cost of taxi trips and parking within the zone, the plan ensures that those who live inside the zone also pay for auto use. The plan will also reduce traffic in neighborhoods adjacent to the zone, decrease vehicle emissions, and benefit the City and regional economy." This is encouraging for a couple of reasons: (1) The plan is better than the Mayor's original proposal, and (2) included in the Plan is a provision for Residential Parking Permits (RPP), which are important to prevent "park and ride" behavior that defeats the purpose of congestion pricing. a press conference this afternoon at 3PM. Fred from the Union-Sackett Block Association shot some great video of the rally. Gowanus Lounge has mirrored the videos here. I'm at the podium about 6:00 into the second video. I have no sound where I am right now . . . hopefully I spoke clearly. interim moratorium that we have been hoping for. unpopular idea to the Council Chambers. way to do and make things better. determination, purpose, conviction and tenacity. It takes resolve. January 30th was Resolution Day. Again, wort reading the entire piece. In comments, Halden from Brooklyn11211 reminds us of an important lesson. When you lock the front door, remember to lock the back door. Truly preserving the character of Carroll Gardens requires a two-track approach, a belt and suspenders approach (enough metaphors? ): (1) downzoning and (2) landmarking. Downzoning limits the height of development; landmarking preserves the look and feel of a community by preventing ugly, non-contextual crap-boxes from being deposited in the nabe. A word of warning to our friends in Carroll Gardens: a lot of the crap that is going up in Greenpoint & Williamsburg is consistent with the contextual zoning that was implemented in 2005 (R6A and R6B, predominantly). Its shorter crap, but its still crap. And other than landmarking, there's not a lot you can do about that. I strongly suggest reading the entire post. I know that there are people who are against landmarking, and I can respect that. But I am for it, and I will work with my neighbors to make it happen. Interested in helping out? Drop me a line. Vince Favorito has been working tirelessly on landmarking and he can always use more hands. TPM had the news. Thus ends the Reilly Household schism: we'll both be voting Obama on February 5th. I've posted before on wavering between Obama and Edwards before settling on Edwards. I'm a policy guy, and I ultimately chose Edwards because we were 100% on the same page when it comes issues like poverty and health care. My one concern about Edwards was whether he could close the deal - he's got the talent, and his heart is in the right spot, but he's missing that intangible quality that creates a movement. I would love to see John Edwards as Attorney General in an Obama administration . . . even as Vice President. Obama, on the other hand . . . radiates that charisma of which mass movements are formed. I think its vital for him to hone his message better, but the delivery can't be beat. Obama is the anti-Kerry. In other news, the creepy, petty tyrant and former Mayor of 9/11 Rudy Giuliani also dropped out of the race today. I'm hoping he crawls into a hole and disappears for a few years, and takes his execrable foreign policy advisor Norman Podhoretz with him. Despite freezing weather and spotty rain, scores of our neighbors rallied this morning on the steps of Borough Hall in support of downzoning Carroll Gardens. This is just the beginning . . . all of the work we've done to date has been to get the ball rolling. I want to thank Bill deBlasio and his office for working with the community and helping to make this happen. We wouldn't have gotten these results without his help. And now we keep the process moving - we can't rest until the process is complete, and the community is protected. Pictures from Pardon Me For Asking (which has a lot of good pics). There were also people behind the cameras, and to the left . . . all in all a great turnout. This one is not a link to the coverage . . . But Fordham University Radio (90.7FM) did a piece on the rally today, and also plays some really terrific music. News 12 Brooklyn (Channel 156 in Brooklyn on Cable TV) will be featuring the Downzoning Rally story today starting at 5:30 PM then repeating it throughout the evening. And NY1 was on the scene as well. The Clarrett Group, which owns the 340 Court development site, has developed a number of condominium projects in recent years. 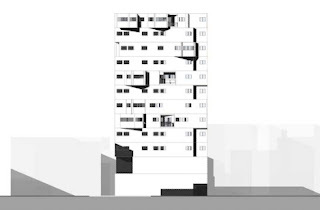 One of their most recent projects is the Forte, a highrise in the BAM cultural district with 110 units. Brownstoner reports that some of the units just got a $100,000 price chop. In other (related) news, the chart above comes courtesy of economic blogger Calculated Risk. Note we are seeing the steepest drop off in new home sales (national) in the 45 years graphed. 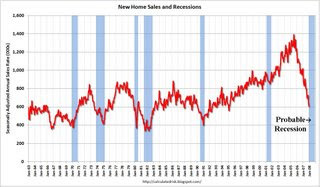 Note also, the unprecedented (and unsustainable) distortion in new home sales caused by the Fed slashing interest rates in response to the recession of 2001 and 9/11. How the correction in housing will affect developers' investment decisions will be interesting to follow. Ditto for the inflationary monetary policy currently being pursued by Fed Chair Bernanke and the Bush administration. Update - I'm having difficulty seeing the graph on my computer. Click the Calculated Risk link if it doesn't appear. "Sales of new homes fell last year by 26 percent, the steepest drop since records began in 1963, the Commerce Department said on Monday." Did I Mention I'm Running For City Council? Well, I've officially thrown my hat in the ring for Bill deBlasio's Council seat. I'll be writing a lot more about my positions in the coming months, but if you've been reading you know that my two hot buttons are transportation policy and development. For now, the Cobble Hill / Carroll Gardens Courier has a great piece out today on my nascent campaign (not available online, sadly). The Brooklyn Paper has a rundown of all five declared candidates here (pictures included). One minor correction: I have filed papers to run, but haven't started fundraising yet. My website will be live next week and you, dear readers, will be the first to know about it. Gary Reilly for City Council! The following is the text of an email from Bill deBlasio's office. The Carroll Gardens Neighborhood Association has also been working this issue for months. I along with community leaders, Brooklyn Community Board 6, and Carroll Gardens residents have brought to the Department of City Planning (DCP)'s attention concerns about the zoning implications of the 'wide street' definition in the R6 zoning district on 1st through 4th Place in Carroll Gardens. I am happy to announce that in response to these concerns, DCP has agreed to put forward an application for a change to the zoning text whereby these streets would be defined as 'narrow streets' for zoning purposes, permitting a lower Floor Area Ratio (FAR) and maximum building heights that are more in keeping with the surrounding character and context of the neighborhood. This zoning text amendment would go through a public review process, and DCP hopes to have this ready for referral by the City Planning Commission in March. I've been saying for a while now that this will be the worst recession we've had in my lifetime, and possibly since the Great Depression. Why? Because the economy (in particular, the housing market) was due to correct in 2001. We had a lot of choices after the attacks of 9/11 with how to stimulate the economy, and the Bush administration and "Easy Al" Greenspan made the wrong ones. Dropping the Fed Funds rate close to zero created a massive bubble in asset prices. Now we're going to pay for it as 7 years of distorted economics get sorted out very, very painfully. Take a look at that chart above (found at the Wall Street Examiner). One of two things needs to happen to get back into the normal range: wage inflation, or home price deflation. Which do you think will happen first? Bernanke seems to be following Easy Al's policy of dropping cash on the problems. Unfortunately, this time I don't think it will work . . . and we're turning the dollar into the peso. The existing 340-car fleet will be replaced, and up to 119 new cars will be added. All the old cars, most of which are about 45 years old, will be replaced by 2011. Each new car costs about $1.3 million. The cars aren't the only improvements. PATH's signal system will be modernized at a cost of $390 million and will reduce the wait time between trains. The agency will also spend $659 million to upgrade its 13 stations. New platforms at the Harrison and Grove Street stations will accommodate longer trains on the Newark-to-World Trade Center line. If the PATH service is better, then the agency hopes to convince more drivers to abandon their cars and take mass transit to lessen the environmental effect of car emissions, Shorris said. Those are the first major upgrades in 45 years. In addition, the P.A. is sinking a few billion into the new (and awkwardly named) THE Tunnel. I'd like to see them expand the PATH sytem as well. It's long past time. Now, to make another point: the Port Authority has basically instituted "congestion pricing" on the crossings they control by jacking the tolls up and investing in transit. We need to do the same on our side, stat. There's a case to be made for merging the MTA and the Port Authority, but that will have to wait for another post. About that Downzoning Rally . . . It looks like I got some bad intelligence on this deBlasio rally, and the rally will actually be Thursday. When I get the definitive word I will post on it.Hello! CORD has received an email from Tom Gray today saying the RALLY date for our downzoning is January 24th not January 29th. Frankly, CORD was never sure about that 29th date for various reasons. It seems very wise to check with the Councilman's office before planning on going anywhere for a rally on either day just to be sure. We understand there is some frustration about this. T.S. Looks like the rally is still on for the 29th. Sorry for the confusion. John Edwards will be in New York taping The Late Show with David Letterman. He will be entering the building at 4 pm and leaving at around 5:30 pm. It would be great to have supporters there with signs when he arrives and when he leaves. It would be good for the press to know what support he has in NYC and it would also let the Senator know that we are here for him. You can go at 4 or 5:30, or stay for both, if you are a hardy soul. This is informal so just show up if you can and make some noise! I’m going to pop out of work and be there by 4 pm. The Letterman Show tapes at around 52nd and Broadway and I’m thinking the Senator will enter/exit at one of the side doors. Also, let your friends know that he will be on that night! Streetsblog has the locations. Most importantly, you MUST fill out and return this registration document to speak at the event. I'll be there. And if that's not a draw, well, I don't know what is. Second, a new coalition of pro-congestion pricing groups, calling itself Communities United for Transportation Equity, presented research suggesting that black and Hispanic riders and low-income riders have the longest commutes of any residents of the New York region. Of the 750,000 New Yorkers who travel more than an hour each way, two-thirds make less than $35,000 a year and only 6 percent make more than $75,000 a year, the group noted, citing an analysis by the Pratt Center for Community Development of census data. This has been a long time coming; an explicit answer to the utterly false, disingenuous brand of populism spouted by congestion pricing opponents. Speaking of false and disingenuous, Streetsblog responds to Councilman David Weprin's latest meretricious attacks here. Let's hope that the end of his council term marks the end of his political career as well. By decongesting the streets not just in Manhattan but throughout the city, as commuters from all the boroughs leave their cars at home congestion pricing would make travel times for bus riders faster. That leads to a virtuous cycle. As traffic is reduced, buses become faster. Faster buses attract more riders out of their cars, which reduces traffic further. Well this was an unexpected treat. I had a couple of meetings in the neighborhood this morning and my business brought me by the old ILA building at 340 Court that is being developed by the Clarett Group. You can read about the Union-Sackett Block Association's appeals to the developers here. 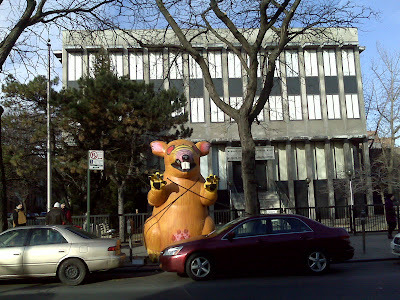 Well, apparently the contractor hired to remove asbestos from the site is using non-union labor, because Laborer's Local 78 was out front handing out fliers and manning the rat. My previous posts on this site are here. UPDATE: Picked up by Curbed. Bob Guskind points out the irony of non-union labor dismantling an old union building. My god, could you imagine the reaction from Anthony "Tough Tony" Anastasia? Good news. I just got off the phone with Andrea Miles-Cole, and there WILL be additional public hearings on the short list of congestion pricing alternatives in each of the outer boroughs. Streetsblog has all the locales. As does the DOT website. It has become fashionable in certain circles to bash Bill deBlasio for perceived shortcomings. I really don't think the guy gets a fair shake; from what I've seen he is tireless in his efforts and is highly accessible to constituents. In any event, deBlasio will be introducing a resolution specifically calling for a downzoning and the functional (but legal) equivalent of CORD's long-sought moratorium on development over 50'. The Carroll Gardens Neighborhood Association has worked hard to make a downzoning happen; unfortunately, City Planning won't prioritize our needs without outside pressure from the Council and the press. Resolution calling upon the Department of City Planning to commence immediately a downzoning study of Carroll Gardens, Brooklyn and upon the Department of Buildings to not issue permits that would allow any new construction or alteration to an existing building to exceed a height limit of 50 feet until the Carroll Gardens neighborhood downzoning is complete. Resolved, That the Council of the City of New York calls upon the Department of City Planning to commence immediately a downzoning study of Carroll Gardens, Brooklyn and upon the Department of Buildings to not issue permits that would allow any new construction or alteration to an existing building to exceed a height limit of 50 feet until the Carroll Gardens neighborhood downzoning is complete. A neighbor informs me she needs to vacate her apartment at . . . First and Court . 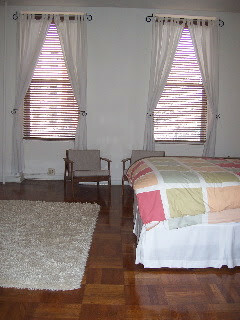 . . to downsize to smaller digs. Residential Parking Permits Meeting 2/4 - Save the Date! Coming up on February 4th is a major meeting on Residential Parking Permits (RPP). Concerned about park and ride commuters circling the blocks and adding traffic to your neighborhood? Worried about overflow parking if congestion pricing comes to pass? Sick of commuters taking up residential spaces? Get yourself to this meeting. Scotto's Funeral Home on First Place at Court Street. Hi – This developer . . . went to the Bureau of Standards & Appeals asking for a variance - claiming hardship because he needed to build a ‘hotel’ on this property to make construction economically feasible (instead of a condo with retail on the ground floor). 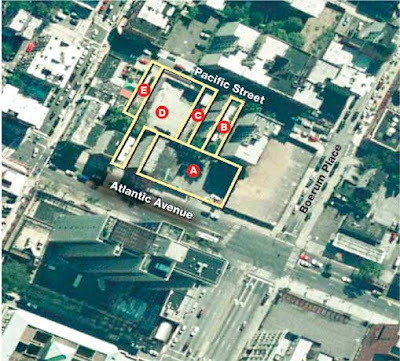 The (sometimes active) Zoning committee of Atlantic Ave. (made up of AALDC, BHA & AABBA) + some other neighbors pointed out that a hotel on this spot – with the parking, taxi and bus pick-ups, etc. - near to the dangerous intersection of Atlantic & Boerum Place - is not acceptable! B of S & A agreed! I had heard that this property would be up for auction and this confirms it. Interesting stuff. More as I get it. Congestion Pricing Alternatives - Make Your Voice Heard! Under that plan, a $4 toll would be imposed on all crossings into and out of Manhattan, 24 hours a day, with higher tolls for trucks. The plan would reduce vehicle miles traveled (VMT) by 7 percent -- qualifying the city for $354 million in federal funds -- while raising an estimated $859 million annually for transit. Unfortunately, Newsday says that the Commission is actually leaning towards a modified CP plan, which would raise far less money for transit and cost more in capital spending. AM NY reports that the Commission will be voting on the plans on January 31, less than three weeks from now. We need to ensure that the best plan makes it to the voting floor: the plan that will raise the most money for transit, in the most cost-effective manner. Who's going to pay for the new trains we'll need for the F Express, after all? There are only two ways to reduce congestion. Less people come to work or you improve mass transit. We don't want less people to come to work and the only way to improve mass transit is with money and resources which we don't have. The City and State are, relatively speaking, going to be relatively broke as we put together the next MTA capital plan. This congestion pricing plan is one of the best hopes for this town to fund the next MTA capital plan. 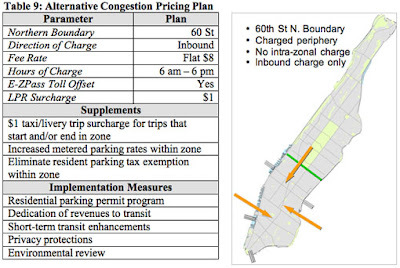 Congestion Pricing Commission Releases Preliminary Report! In one option, the panel proposes placing $4 one-way tolls on all the bridges across the East River and the Harlem River. That would both cut traffic and raise $859 million a year for mass transit projects, according to the report. The report also includes a package of measures that could be added on to any of the plans, such as raising parking charges or cutting back on the parking placards given to city workers and placing an $8 surcharge on taxi trips in the congestion zone. The 72 page pdf (warning!) can be downloaded here. I haven't had a chance to read it yet, and probably won't until the weekend. Then I'll have a more detailed post up. .61 Acres in 5 Contiguous Parcels Between Atlantic Ave. and Pacific St. and Boerum Pl. and Smith St.
Frontage: 177’ on Atlantic Ave. & 150’ on Pacific St. Mother of God! Any guesses on what this will go for? I think the market is softening; this will provide a good measure on how that trend is progressing. Also of note, development of this site might obviate the need for the execrable floorplans of the Le Chien Merde, so there's that. Subways, buses and commuter trains last year carried more riders than they have in decades - with Metro-North recording the highest annual tally in its 25-year history. "Record ridership is a direct result of billions invested to make the system more reliable, modern and safer," Metropolitan Transportation Authority spokesman Jeremy Soffin said. "We must continue to make these capital investments to encourage use of public transportation and to keep our region growing." Mass transit is absolutely essential to our continued prosperity. Besides the obvious environmental benefits, mass transit reduces our reliance on imported oil. For air quality, for better land use decisions, for preservation of open space and wilderness, for national security . . . funding mass transit well pays back dividends to society many times over. 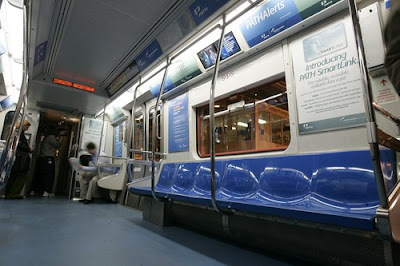 Mr. Spitzer, Mr. Bloomberg: fully fund the MTA capital plans. MTA Board of Governors: let's see some daring plans to build out our rail infrastructure to get more people out of their cars and onto mass transit. Here are a couple of ideas to get the ball rolling. Think regionally - MetroNorth and LIRR should partner up with NJ Transit for joint tickets, planning, etc. At some point, the PATH system should be merged with the NYC Transit system as well. A bold vision for the Second Avenue Subway - Propose a full SAS that extends from Co-op City in the Bronx, along the Brooklyn waterfront and under the Narrows to Staten Island. The Fifth Borough should at long last be integrated into the NYC subway system. Consider extending the 7 line under the Hudson River to our neighbors on the Jersey side. Expand service in Queens, and create a subway link to LaGuardia airport. Edwards will do better than expected. Hillary will do worse than expected. Obama will win as expected. My Hope: Edwards ties or beats Hillary. Ron Paul will do better than expected, beating both Thompson and Captain Combover, Rudy 9-11-ani. Huckabee will beat expectations. No prediction on the Mitt/McCain order. 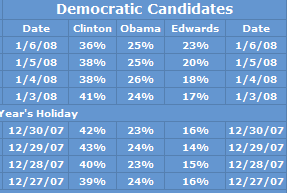 The Democratic race becomes a two-candidate race between Edwards and Obama. As the myth of Hillary's inevitability is smashed, her supporters (mostly lured by her supposed invincibility) defect in droves. Remaining are the 20-30 people who are actually passionate about a Hillary presidency. And just MAYBE . . . that the media will be forced to take seriously campaigns by non-corporate candidates. NEXT DAY UPDATE: And that's why I don't get paid to predict these things. Glenn Greenwald has a great post on the way the establishment media corrupts the discourse. Of note among many transgressions is the under-reporting on John Edwards, who has been largely ignored by this crowd, despite . . . well anything he does. Unless he gets a haircut. That, of course, is hard news. I'll update this when I get a chance, just wanted to get a quick post in. But look at the dramatic improvement in Edwards national numbers over the past 11 days . . . and yet, the dominant narrative is about a Clinton-Obama race. The narrative is false; Hillary WILL NOT be the Democratic nominee. The ultimate choice will be between Obama and Edwards. I like 'em both, but Edwards is the more progressive candidate. Ultimately, the ONLY way we can lose the election is by nominating Clinton. And I don't think itwill happen. Brooklyn's chapter of the AIA has come out with an alternative plan to replace the derelict Gowanus Expressway with a suspension bridge down 1st Avenue. Details are sketchy so far. I've written the group to request more details. The most palatable part of the proposal, a Greenway down 3rd Avenue, would also be a key ingredient to the proposed Gowanus Expressway Tunnel. While I think a tunnel is the best alternative, one thing is clear: the Gowanus Expressway is a hulking blight across South Brooklyn's landscape that must be erased. Removing this obsolete structure and replacing the grimy shadows with a greenway would not only spawn a renaissance of the 3rd Avenue corridor, but also yield tremendous health benefits from improved air quality. In addition to the suspension bridge, the AIA plan includes support for the Cross Harbor Freight Tunnel, another much-needed improvement that would remove thousands of trucks from Brooklyn Streets. Court documents alleged that "literally dozens" of witnesses said they feared Brooks, based on a "history of intimidation and threats." 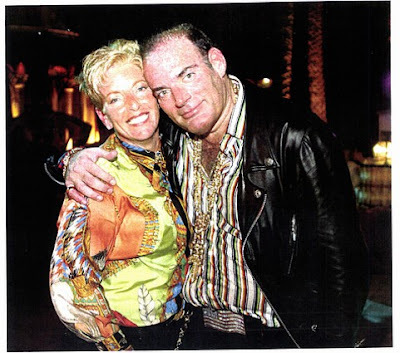 The documents alleged he had ties to organized crime and, more recently, sent $4 million to tribal holy men in Senegal, West Africa, for religious ceremonies to win his acquittal. That country does not have an extradition treaty with the United States. Picture of the virtuous, railroaded and completely innocent Brooks taken from Newsday. Earlier post on David H. Brooks indictment HERE. Those uninspiring renderings of the future of Hudson Yards have been revised, and the new versions are waayy more exciting. Cap'n transit has the scoop (and I'm late to the party). Check it out! Having a fun discussion of the NYC subway scene of 2108 over at Second Avenue Sagas. Imagine a Second Avenue Subway running from Co-op City to Staten Island. Dream big, or live small. Via Streetsblog, the NYT ran an OpEd I missed over the holidays: The High Price of Parking. It's not what you might think. In most of New York City, a developer who puts up a new building is required to provide a minimum number of parking spaces. These requirements were first put in place in 1950, when the prevailing wisdom was that the automobile would be the transportation mode of the future. . . . . But off-street parking requirements have themselves become an expensive problem: developers must devote money and space to parking lots and garages, or not build at all. This limits the supply of housing, retail and office space, creating higher rents for residents and businesses, and higher prices for consumer goods. . . . . The parking requirement also creates a subsidy for cars at the expense of the economy and environment. By forcing developers to provide parking, we are making it easier to drive. In New York, the public transit capital of America, this is disgraceful. . . . . Eliminating the parking requirements will reduce traffic congestion and pollution, and it will free acres of land for new housing, stores and offices. It will allow all developers to build more affordable housing and encourage more convenient, transit-friendly retail and commercial destinations. This rings true for me. And it brings me back to a point I read in the Union-Sackett notes from their meeting with the Clarrett Group over 340 Court Street. Is it really appropriate to require a minimum of 70 new parking spaces in this development? I understand that parking in the neighborhood is tight as it is. But creating more parking attracts more cars, just as building more highways creates more traffic. While I still think Obama could make a good president, over the past several months I've found myself gravitating to Edwards more and more. This diary speaks to some of the reasons why. At base, I strongly identify with Edwards' populist message; there really are two Americas, and the gulf between them has widened to a sickening, seemingly bottomless crevasse. I don't want a candidate who thinks he/she can work better with the Republicans. I want a candidate that will fight! And that candidate is John Edwards. I've been arguing to friends for the past couple of months that as the economy continues o weaken, as the fraud and chicanery in the financial markets unravels, that Edwards populist message will become more and more attractive. To an extent, it's happening already, but will only accelerate through November. In any event, two months ago I was arguing for Edwards to make a strong showing in Iowa. My prediction and hope is (1) Edwards, (2) Obama, (3) Clinton. As for the GOP clownfest, I have no predictions, except to say that the lumbering Fred Thompson will finally give it up, and Rudy will get shellacked. The good folks at the Union-Sackett Block Association met with the Clarrett Group and sundry other community activists to discuss concerns over the planned development at the ILA Building site. A very thorough account of the meeting is posted HERE. 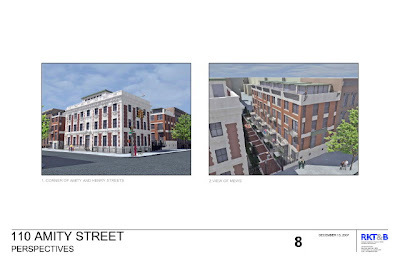 Cobble Hill Under Siege, Part II: "Le Chien Merde"
Compared to this monstrosity (h/t Brownstoner), the proposed "mews" at Amity & Henry is utterly non-controversial. This . . . thing rises 12 stories, dwarfing it's neighbors and creates a jarring effect on the street wall above the second floor. Click through this link to architect Chien Dao Studios for six views, including floorplans . . . the second rendering shows the full extent of the horror show. Granted at the outset, this lot is currently vacant (formerly a parking lot) and should absolutely be developed. But this proposal is simply terrible: please, please go back to the drawing board. The local community is vehemently opposed to this development that changes the block structure around to create a gated community shoe-horned into the block only to maximize profit. They call it a "mews". 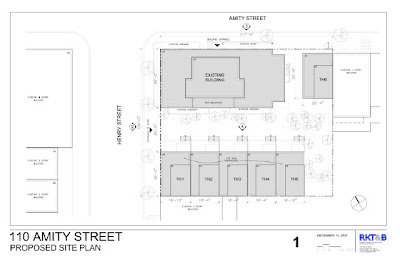 The plans will be submitted to CB6 January 3 at 6pm at 250 Baltic Street. Please circulate this and tell everyone you know. Please come if you are able to. Following this meeting, the project is scheduled to be presented for approval at the Landmarks Preservation Commission on January 8 (time to be specified). June and Steven Negrycz are spearheading the effort with their neighbors on the block. • Hudson Raritan Estuary — Gowanus Canal, New York, Environmental Restoration Project: $214,000 to continue the feasibility study for the environmental restoration of Brooklyn’s Gowanus Canal. • Southwest Brooklyn Industrial Development Corporation’s Red Hook Green Roof Project: $250,000 for a project aimed at promoting the use of green roof design as a cost effective and viable strategy for increasing energy efficiency and reducing heat reflection that contribute to the greenhouse effect. Kudos! Now, if we can get the funding for burying the Gowanus Expressway in the next TEA bill, that would be great. And while we're at it, funding for the Cross-Harbor Freight Tunnel. I'd like to thank the academy . . . and Second Avenue Sagas, which brought this little accolade to our attention. By the way, both of those sites should be in your daily rotation. We've still got plenty of work ahead of us . . . and there is the Culver Viaduct Rehabilitation and total renovations of the Smith & Ninth and 4th Avenue stations in our future. But I am confident that with continued community outcry, we will see a return of the F express when those projects are completed. And we can't settle for less than enhanced F/V&G service on the line. Happy New Year to all.